For the foreseeable future, there is one happy inevitability surrounding the legacy of Jimi Hendrix: new releases will add chapters to the story of Hendrix’s imposing work. 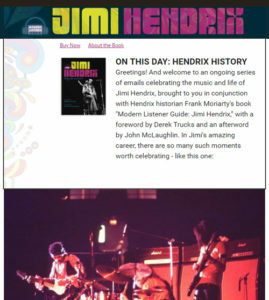 And author Frank Moriarty will continue his own work documenting and analyzing the music of Jimi Hendrix. Here Modern Listener Guide: Jimi Hendrix lives on into the future. Beginning with the late 2018 release of a multi-disc 50th anniversary edition of Electric Ladyland, that title and all subsequent Jimi Hendrix releases will receive their own chapters right here, free of charge and for all to enjoy. Unlike the book’s chapters, these online chapters will have no narrative content – they will directly focus on each new release. The format may be a bit less formal and a touch more conversational, but hopefully no less enlightening. For the full story of a remarkable musician’s life and all the amazing sounds he created – the hundreds of hours of creativity that paved the way for these new releases – please order your very own copy of Modern Listener Guide: Jimi Hendrix.